Preservation Month Lecture: Is Adobe Relevant Today? Wednesday, May 16, 12pm noon. All adobe-making events are free to the public. Lecture may be subject to museum admission. Cornerstones and Historic Santa Fe Foundation will host four Saturdays of traditional adobe brick making in Santa Fe during Heritage Preservation Month. For the first two Saturdays of the month – May 5 and May 12 – staff and volunteers will set up the hands-on workshop/demonstration in the courtyard of the Palace of the Governors with the third and fourth Saturdays – May 19 and May 26 – hosted at San Miguel Chapel. 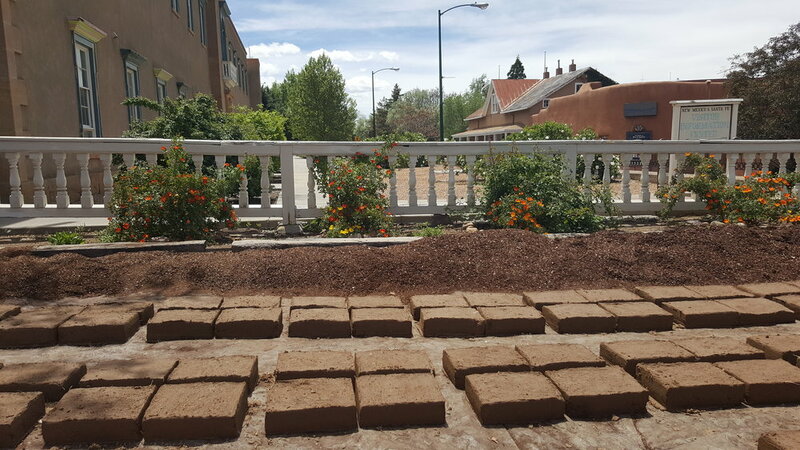 All Saturday events will be from 9:30am – 1pm and people of all ages are welcome to visit, ask questions and participate in making traditional adobe bricks. Cornerstones will use each full-size brick to restore buildings in Northern New Mexico and each participant will be mailed a Certificate of Accomplishment with detailed information about the new home of their bricks. Cornerstones Executive Director Jake Barrow will deliver a lecture titled Is Adobe Relevant Today? at the New Mexico History Museum, Meem Room on May 12 at noon. Attendants can bring a brown bag lunch to enjoy during the talk. This event coincides with Heritage Preservation Month and is supported by Hotel St. Francis, a Heritage Hotel & Resort property, St. Michael’s High School, New Mexico History Museum/Palace of the Governors. Cornerstones works in partnership with communities to restore historic structures, encourage traditional building practices and affirm cultural values. For more information, call Nicole Liebert at 505.982.9521, email nkliebert@cstones.org or visit cstones.org. The Historic Santa Fe Foundation (HSFF) is a private, non-profit membership organization founded in 1961. HSFF is dedicated to the preservation of Santa Fe’s historic buildings and neighborhoods. Our mission is to preserve, protect and promote the historic properties and diverse cultural heritage of the Santa Fe area and to educate the public about Santa Fe’s history and the importance of preservation. For more information, contact Melanie McWhorter at melanie@historicsantafe.org, call 505.983.2567 or visit historicsantafe.org.